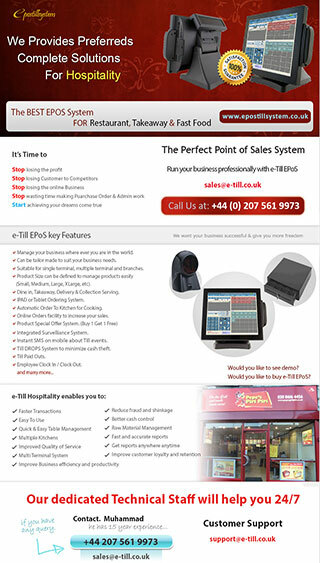 EPOS (Electronic Point Of Sale software), is becoming a normal and expected tool in just about any up to date hospitality outlet, be it restaurant, hotel, or a coffee shop. The most difficult issue of a restaurant or hospitality point of sale system is stock management, including ingredients purchases and recipe changes as per customer requirements and management. The simple fact in a restaurant is that many foods coming in fresh daily are not EPOS friendly. 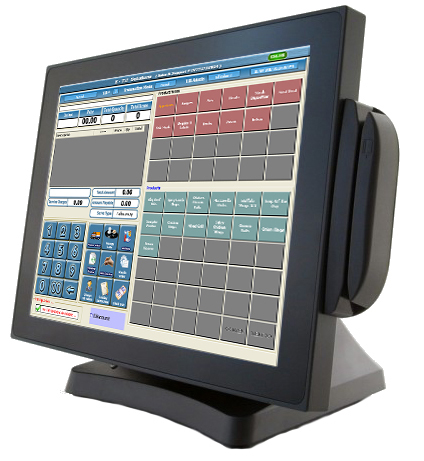 The EPOS system developed by E-Till EPOS System is user friendly it by getting this the restaurant needs to keep smaller quantities of ingredients and grocery on premises, making the food fresh overall. As you are considering specialized hospitality EPOS system, there will be other functionalities that you can use as well as ordering and paying. A function for reservation and table management can be easily included. This clever EPOS system helps you to avoid double bookings and will help you along with the process making it much more efficient. IPAD / PDA Ordering System For (Eat In & Takeaway). Product can have Multiple Sizes Or Flavors of Each Product with Different Prices. Products can have Free & Priced Toppings & Sides. Customer Cooking Instructions for Chef. Detailed Order with all Toppings and Customer Instructions will be printed in kitchen for Chef. Beep System For New Order Alert. Category Wise Kitchen Print For Easy Understanding. Complete Order can be printed for Collection Counter to manage items in an Order. Every Product Can Have Same Or Different Prices for Eat In & Takeaway. Eat In & Takeaway VAT System. Raw Material Usage System (For Stock Handling). Delivery Customer details are saved for fast access in future. Mileage Calculation For Delivery Orders. Road Map Instructions For Delivery. Service Charges (Automatic / Manual). Pending Order Details is Available to allocate time. Unpaid Orders can be viewed and selected for payment. Order Status can be maintained. (Cooked, Delivered, Paid) To keep track of Pending & Unpaid Orders.